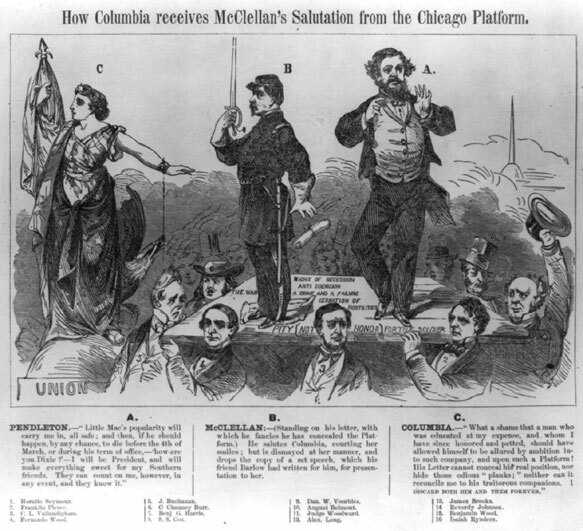 Description: Columbia repudiates Democratic presidential candidate George Brinton McClellan’s endorsement of the platform devised at the August 1864 Democratic convention in Chicago. The text below the picture provides the dialogue, descriptive notes, and identification of the main characters. McClellan and his running mate George Hunt Pendleton are shown here standing on a platform surrounded by various Democrats–many of them New Yorkers. Pendleton stands at right, his thumbs in his lapels, boasting, “Little Mac’s popularity will carry me in, all safe; and then, if he should happen, by any chance, to die before the 4th of March, or during his term of office,–how are you Dixie?’–I will be President, and will make everything sweet for my Southern friends. They can count on me, however, in any event, and they know it.” McCellan, in uniform, raises his sword. He stands “on his letter, with which he fancies he has concealed the Platform. He salutes Columbia, courting her smiles; but is dismayed at her manner, and drops the copy of a set speech, which his friend Barlow had written for him, for presentation to her.” Although McClellan ran on a peace plank, his letter accepting the Democratic nomination defended the war. Columbia: “What a shame that a man who was educated at my expense, and whom I have since honored and petted, should have allowed himself to be allured by ambition into such company, and upon such a Platform! His Letter cannot conceal his real position, nor hide those odious planks;’ neither can it reconcile me to his traitorous companions. I DISCARD BOTH HIM AND THEM FOREVER.” Sixteen men support the Democratic platform on which McClellan and Pendleton stand. They are (clockwise from lower right): New York governor Horatio Seymour; former President Franklin Pierce; Clement Laird Vallandigham, author of the peace plank; New York congressman Fernando Wood, an organizer of the Peace Democrats; former President James Buchanan; C. Chauncy Burr; Maryland congressman Benjamin G. Harris; Ohio congressman Samuel Sullivan Cox; Indiana congressman Daniel W. Voorhees; banker August Belmont; “Judge Woodward”; Ohio congressman Alexander Long; James Brooks, publisher of the “New York Express;” Maryland senator Reverdy Johnson; New York congressman Benjamin Wood; and Isaiah Rynders.